Q1. Compare the properties of electrons, protons and neutrons. Q2. What are the limitations of J.J. Thomson’s model of the atom? Thomson’s model explained that atoms are electrically neutral, the results of experiments carried out by other scientists could not be explained by this model. Q3. 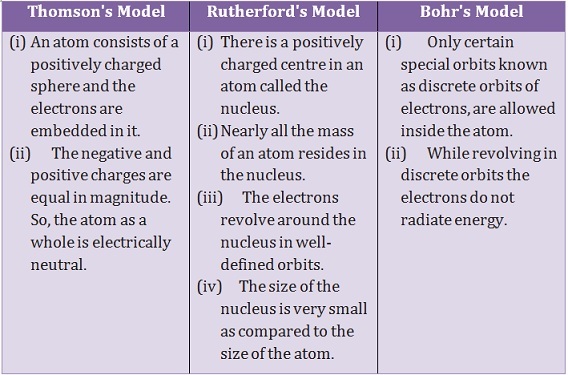 What are the limitations of Rutherford’s model of the atom? The electrons revolve around the nucleus. The orbital revolution of the electron is not expected to be stable. Any particle in a circular orbit would undergo acceleration. During acceleration, charged particles would radiate energy. Thus, the revolving electron would lose energy and finally fall into the nucleus. In this case the atom should be highly unstable and hence matter would not exist in the form. But this is not fact we know atom is stable. Q4. Describe Bohr’s model of the atom. (i) Only certain special orbits known as discrete orbits of electrons, are allowed inside the atom. (ii) While revolving in discrete orbits the electrons do not radiate energy. Q5. Compare all the proposed models of an atom given in this chapter. Q6. Summarise the rules for writing of distribution of electrons in various shells for the first eighteen elements. (i) The maximum number of electrons present in a shell is given by theformula 2n2, where ‘n’ is the orbit number like n=1,2,3,4,…. or energy level index, 1,2,3,…. and so on. (ii) The outermost orbit can be accommodated by a maximum number of 8 electrons if they do have more than 8 or 18 electrons. 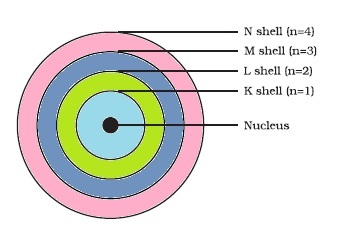 (iii) Shells are filled with electrons in a step wise manner i.e., the outer shell is not occupied with electrons unless the inner shells are completely filled with electrons. Q7. Define valency by taking examples of silicon and oxygen. Answer: The electrons present in the outermost shell of an atom are known as the valence electrons. This number of valence electrons is called valency. (iv) Isobars. Give any two uses of isotopes. (i) Atomic Number : The number of protons present in the nucleus of an atom is known as atomic number. Example : (i) Hydrogen (H) has only 1 proton in its nucleus therefore Atomic Number of Hydrogen is 1. (ii) Sodium (Na) has 11 protons in its nucleus therefore Atomic Number of Sodium is 11. (ii) Mass Number : The sum of number of protons and neutrons present in nucleus of an atom is known as atomic mass. (iii) Isotopes: The atoms of an element are called isotopes of that element which has equal atomic number but different atomic mass. (iv) Isobar : The atoms of an element are called isobar of that element which has same atomic mass but different atomic number are called isobar. Example : Calcium and argon has same mass number of both these elements is 40. But the atomic number of calcium is 20 and argon is 18. These elements are called isobar. Q9. Na+ has completely filled K and L shells. Explain. Answer : Normally, Electronic configuration of Na is 2, 8, 1. In this case Na+ completely filled K and L shells. As K and L require maximum number of electron that these hold are 2 and 8.